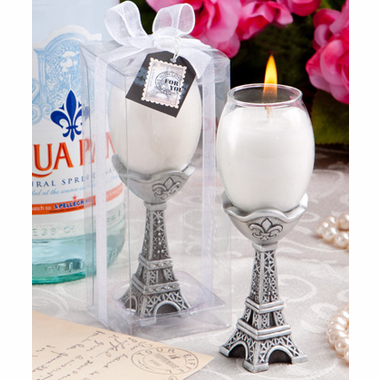 Our new Paris prom theme candles will give your attendees a romantic reminder of your special event! These lovely favors are perfect for Paris prom decorations or any other French themed party! Recognized as one of the most romantic places in the world, the Eiffel Tower is an icon to dramatic stories. 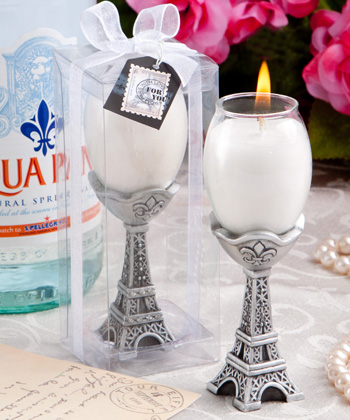 You can bring the magic of Paris to your prom theme party tables with these "Tres chic" candle favors! Each measures 4" tall x 1" wide, the Eiffel Tower replica candle is made of silver tone resin on the base to represent the famous detailed design. At the top is a glass candle holder with a poured white candle inside. Each candle comes in a clear box and is finished with a white organza ribbon and a "From Paris With Love" tag.